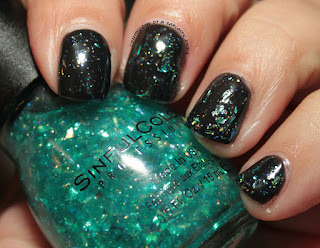 SinfulColors has a new collection! The Back to School collection consists of 27 shades (some are repromotes), and it features a new demi matte finish! It's not quite matte, but it's definitely not glossy. It has a waxy look to me. I've got 10 of the shades to show you! I really like this demi matte finish! I'm really into matte (both nails and lips) right now. 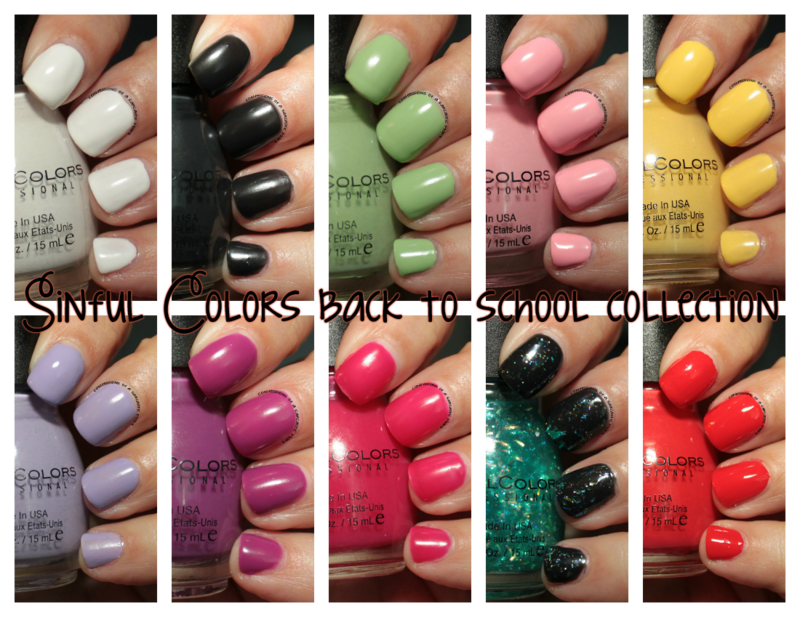 Formula on them is great - I have all of them pictured in 2 coats. Sometimes mattes have a tendency to be streaky from the get-go, but these were ok. Some of them have a jelly-like quality, too! Whiteboard - a white demi matte. Went on smooth and silky. The first coat would have the potential to drag if you try to put too many brush strokes into it. Blackboard - a black demi matte. Could be a little deeper in hue, but it still works. This one had a decidedly jelly-like finish at first. It's definitely on the sheer side. Chalk It Up - a pistachio green demi matte. I really love this shade. It's very unique with this finish. Totally see myself weating it over and over. Pink Break - a soft pink demi matte. I could see myself pairing this with Whiteboard and Chalk It Up for some nail art! VIPeach - not sure why it's called "peach" because this is certainly a yellow demi matte. It's got a great formula for a yellow, which is always a plus! Truth or Lavendare - a light periwinkle purple demi matte. I really like how this one applied. I was able to get a good base with one coat! You can see on my pinky the coat may have not been enough, but still. Hazed - a purple demi matte. I wanted to like this one so much, but it sort of felt flat to me. Maybe another coat might have helped. It sure is a pretty shade. This one has that sheer quality to it, as well. RADient - oh my! This is a hot pink sheer demi matte. 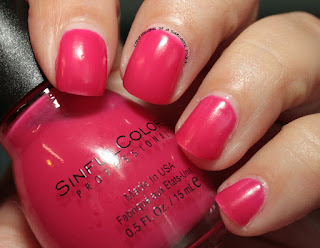 I really really like this shade, despite my aversion to pinks. It just really pops, and I truly enjoyed wearing it. It's maybe a bit brighter in person. 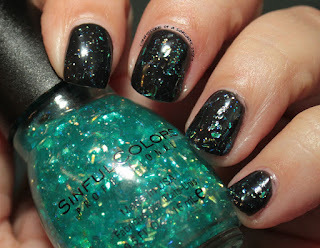 Late Night Haute - a seafoam-y green glitter concoction. The base has a greenish tint to it and the glitter pieces are silver, green and metallic. There's bar glitter in there, as well as the shards. This is one coat swatched over Blackboard. Energetic Red - a brilliant red creme. Easy to apply and a great formula. 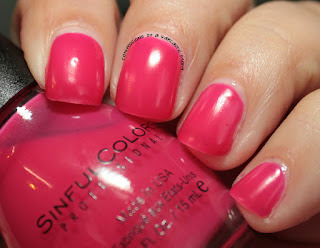 I really love this color, and I do see its potential to be a staple in my nail polish arsenal! Do you have a lot of SinfulColors polishes? Want to see how these compare to others? You can check out my friend Jessica's post here. She's got several comparisons!